For the pictures, see below. 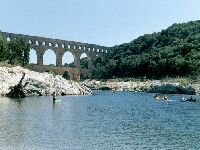 The N�mes aqueduct is one of the best preserved and best researched ones in the Roman world. 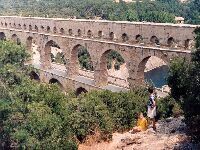 In the period 1984 - 1990 detailed studies were made on the aqueduct from its source in Uz�s via the famous Pont du Gard into the upper regions of the city of N�mes. 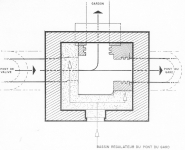 The results of the research were published by Guilherm Fabre, Jean-Luc Fiches, Philippe Leveau and Jean-Louis Paillet. 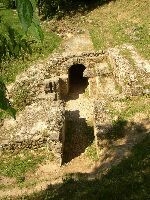 This interdisciplinary team paid attention to all relevant archaeological, geo-morphological and hydrological aspects of the aqueduct. 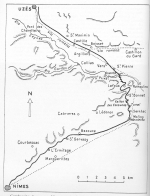 Most other publications have their focus on the Pont du Gard, while only some also pay attention to the unique and well-preserved castellum divisorium (distribution basin) in uptown N�mes, the source and the castellum in Uz�s and the tunnels along the downstream section. 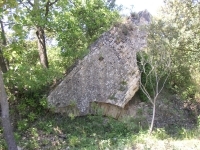 The nearest source of high-quality water for Nimes was a spring called Source de l�Eure in Uz�s, located near UCETIA (now Uz�s), which drains a 45-50 km2 catchment area. 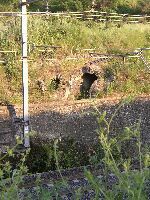 A direct route over 20 km to Nimes would have required a tunnel of 8 km. 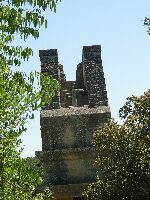 A detour to the west was nearly impossible because of hills. 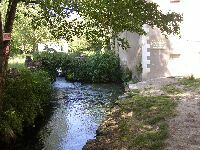 The only alternative was a detour to the east, partly along the rivers l�Alzon and Le Gardon which nearly 50 km long (see also photograph). 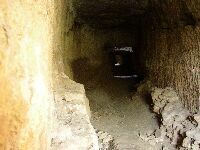 The aqueduct channel, of which 90% was subterranean, was typical 1,2 m wide and 1,8 m high. 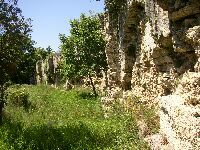 The overall fall was only 15 m from the source to the castellum divisorium (distribution basin) in uptown Nimes which gives the aqueduct one of the flattest gradients among the Romans aqueduct. 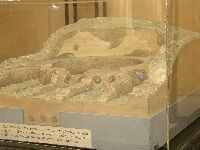 The maximum capacity was 35.000 m3/day but because of leakage, illegal taps and encrusation the capacity at the end of its life was 10.000 m3/day. 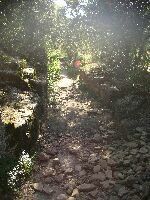 Some 800 m from the source a regulation basin (castellum aquae) was built. 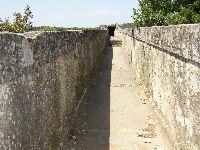 Because of the flat gradient the aqueduct system could easily be overflown with too much water. 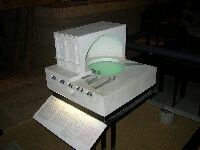 Measurements shows that today the Eure source has a great variability in output. 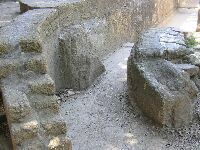 If that was also the case in ancient times some regulating device was necessary to divert excess water into the nearby Alzon river. 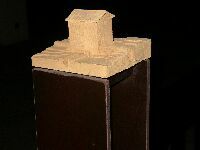 One of the side walls of the basin had double vertical grooves into which wooden sluice planks could be fitted. 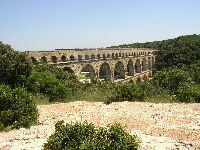 The Fabre team also did excellent work in studying the regulation basin just 250 m upstream from the Pont du Gard. 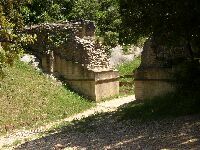 In ancient times during maintenance work on the Pont du Gard, the exit channel of the basin was closed and the water flowed by means of a discharge pipe into the river Gardon. It seems that this outlet channel was used often but was never cleaned. 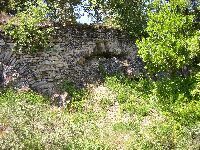 It is now almost completely blocked by encrusation. 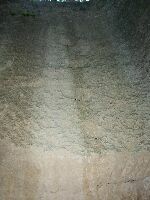 Unfortunately nowadays the basin is covered with sand to protect it. 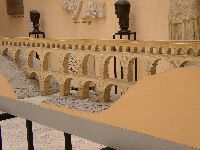 Just before the regulation basin close to the Pont du Gard some fine arcades can be admired, the Pont Rou(pt) and the Pont de Valive. 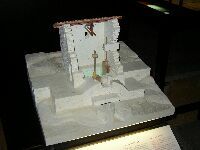 They are known because of their stockpiles of encrustation material. 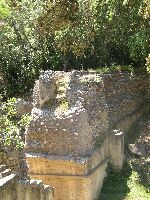 The NW abutment of the Pont du Gard is quite abrupt, the SE abutment makes a smooth junction to the next parts of the aqueduct. 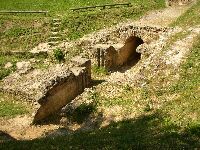 On this side the aqueduct channel was laid down on several bridges to cross side branches of the river Gardon. 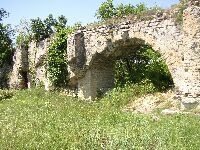 On the photographs the Valmale bridge. 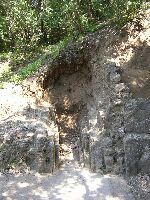 North of the village of Sernhac, 10 km downstream of the Pont du Gard, two striking wide tunnels were dug out in which the aqueduct channel got its place: Tunnel de la Perrotte (originally 74 m but now 65 m) and the Tunnel des Cantarelles (60 m long). 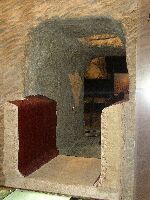 In both cases it is unclear why these tunnels were made � an easy detour was easier � why they were so wide and why these were so sinuous although 3 respectively 2 manholes were made. 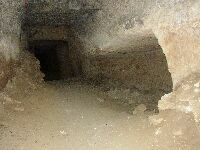 Many niches have been found for the oil lamps to light the workers. 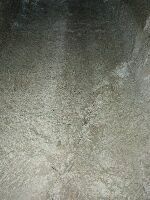 Detailed study of the axe marks in the wall threw new light on the methods used for the construction of the tunnels. 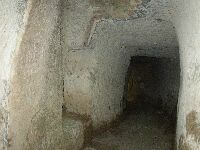 Under the village of Sernhac a 400 m long tunnel with 8 manholes was dug out; unfortunately this section is partly damaged and not open for the public. 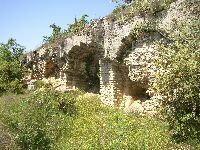 S of Sernhac and close to Le Gr�s, the railway track between Nimes and Pont-Saint-Esprit cuts almost perpendicular the trace of the aqueduct. 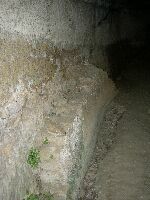 Right on this spot a second conduit was found, parallel to the heavily incrusted Nimes aqueduct channel, but with reverse slope and without any trace of incrustation. 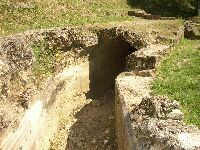 This channel could have been a part of a sewer system for a nearby villa rustica but the general view is a kind of emissarium to drain a nearby pond. 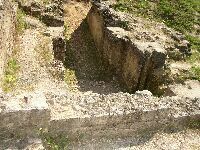 The distribution basin � in Latin: castellum divisorium � is world known and one of the few of its kind (an other famous one is located near the Versuvius gate in Pompeii). 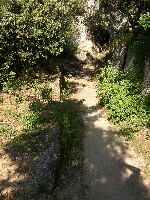 It is situated in a higher part of Nimes, in the Rue de la Lamp�ze close to an old fort from the � c AD, now a part of the university of Nimes. 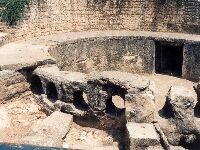 Its function was to divert the aqueduct water to the main consumers: the local bath house(s), the public fountains and some privileged individuals with running water at home. Here the open conduit system was replaced by 10 [lead?] 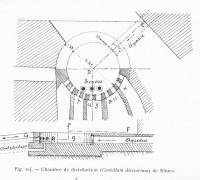 pipes (a closed system) of 0.30 m in diameter, each of them with a specific function and/or for distribution of the water to specific areas in the town. 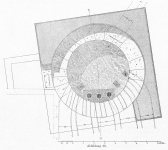 �[The castellum includes] a circular basin, 5,50 m in diameter and 1.40 m deep, bordered by a flagstone walkway and surrounded by a wall in coursed rubble stonework. 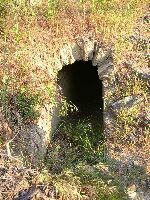 Entry to the basin was through a door on the north side, but only the threshold stone still remains. 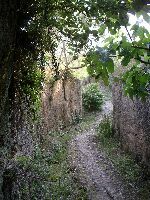 The aqueduct entered the basin through a conduit which was almost square. 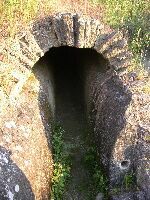 A removable grill was fixed to this conduit by means of six holes pierced into the stone slabs over the channel. 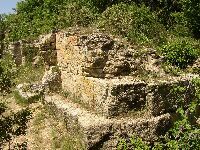 Just beyond this metal grill there was a sluice-gate for regulating and measuring the water flow� (fabre1992).